Weekly Update - So many ways to get involved! Happy February! I don’t care what the calendars say… February has always meant springtime in Reedsport to me. Goodbye cold rain, hello sunny rain! Supposing that there will be NO rain this Saturday, February 6th, we are holding another Community Volunteer Day to spruce up the town. When we last gathered in November, we had a great time cleaning up abandoned gas stations and other spots that desperately needed a little love. This time we’ll focus our attention on clearing some brush between 101 and the Coho Marina pond near the Scholfield Bridge (see the photo to the right.) We’ll also try to improve public access to the river, depending on what materials we have on hand. We’ll meet at 10am in the parking lot by the Oregon Dunes NRA Visitor’s Center before heading out. Bring work gloves and, if you have them, hand tools. We’ll take a break for a BBQ lunch at noon. Would you like to join the effort and make a difference? If so, please contact me! Next weekend on February 12th and 13th at the Community Center we have another great event, Confluence 2016! 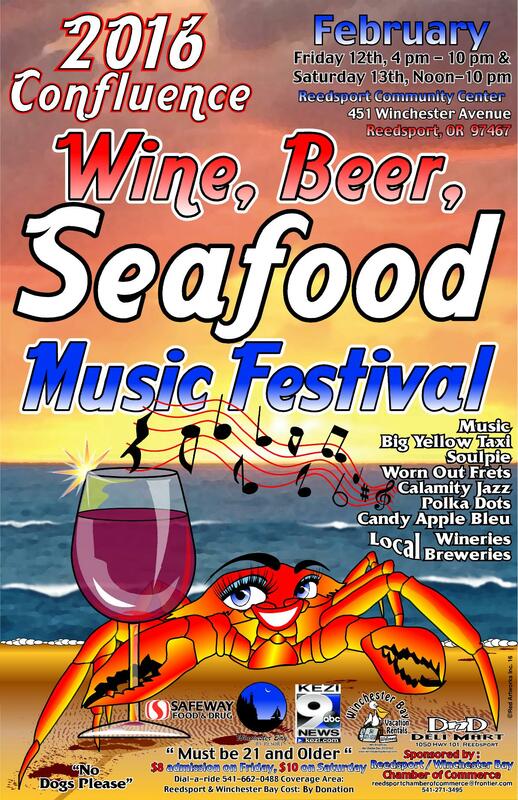 If you’d like to check out this festival of local wine, beer, music, and seafood, why not go for free? Volunteers who staff our booth for three hours will get free admission to the festival for that day. For everyone else, swing by and say “hi” when you get a chance. We’ll be selling non-alcoholic beverages and merchandise, with lots of information about our current projects and ways that you can support the work we’re doing for Reedsport. One such project is our Façade Improvement Grant. Have you seen new murals, signs, landscaping, coats of paint, and planters popping up here and there? Chances are that these were funded by our grant! Our grant, in turn, was entirely funded by donations from various organizations and private citizens throughout the community. We’re very grateful for all of these contributions, and so are the businesses who were able to do work that otherwise might have been unaffordable. Would you like to continue to see improvements along our main street corridor? If so, consider making a donation to fund the next round of our grant. And spread the word! Here’s something else to start talking about – history. Lots of us have a deep passion for it, but our own history is fragile and quickly disappearing. We’re starting a campaign to build a community collection of digital copies, a collection that will allow us to preserve and share our history without taking up physical space. Do you have pictures or stories that we can copy? Would you like to volunteer to ask questions and record information about what people bring? We’re kicking off this new campaign with an event on March 4th. Please read more about it here. Finally, please take note of our upcoming meetings, which are open for all to attend. Our next Promotion Committee meets February 9th at 5pm in Bedrock’s Restaurant here in Reedsport. The Economic Development Committee meets the next night, February 10th at 5pm in the conference room at City Hall. (Please note, this is a change from the original meeting date.) Our next Board of Directors meeting will be on February 16th at 5pm in the conference room at City Hall. We always have a lot to talk about. Why not come and join the conversation?